Goffs was a rail junction from 1893 to 1923 serving both a desert shortline and the Santa Fe mainline. In 1902 Santa Fe developed facilities and a depot was constructed and functioned as home to a section crew until 1956. 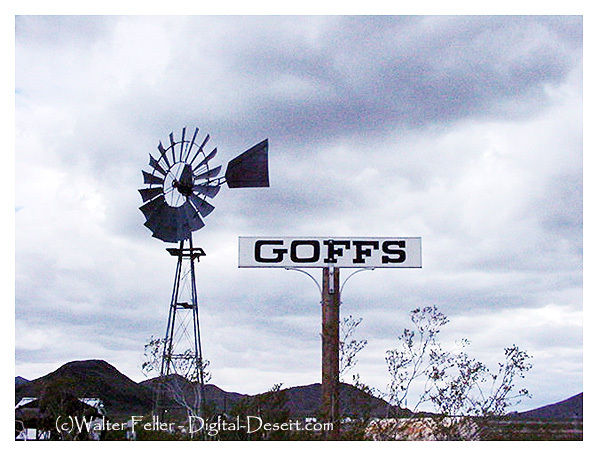 Goffs, California, is a nearly empty one-time railroad town at the route's high point in the Mojave Desert. Goffs was a stop along famous U.S. Route 66 prior to 1931, when a more direct route between Needles and Amboy was built. Goffs was known as Blake between 1893 and 1902. It was named for Isaac Blake, the builder of the Nevada Southern Railway (later the California Eastern Railway 1895–1923) that commenced here. An early 20th Century general store is the town's largest building (now abandoned). A historic schoolhouse, built in 1914 and almost totally deteriorated by the early 1980s, has since been renovated to its original plans by the Mojave Desert Heritage and Cultural Association (MDHCA). The schoolhouse and grounds now house a museum primarily specializing in the area's mining history.